The Seamaster 2017 ITTF World Tour Platinum German Open drew to a close on Sunday 12th November as spectators witnessed four trophy encounters being played out on the concluding day of the tournament at the GETEC-Arena Magdeburg. Missed any of the day's action? Then take a look at our quick review. Miu Hirano and Hina Hayata picked up the first title win of the day with the Japanese pairing receiving the Women’s Doubles gold medal. Making their tournament debut as a partnership Miu Hirano and Hina Hayata, both aged 17, pulled off a straight games victory over Chinese Taipei’s Cheng I-Ching and Chen Szu-Yu (11-7, 11-8, 11-9) to reach the top step of the podium. Japan was also involved in the Men’s Doubles title match but the country had to settle for a silver medal finish in the category with Yuto Kizukuri and Tomokazu Harimoto losing out to Korea Republic’s Jeoung Youngsik and Lee Sangsu in a five games thriller (8-11, 3-11, 11-5, 16-14, 11-6). 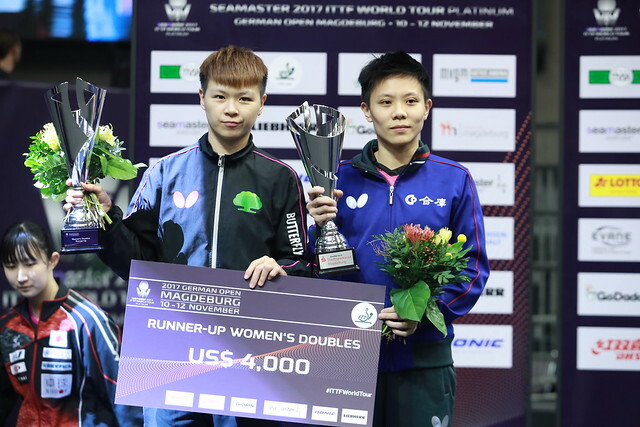 Next up was the contest for the Women’s Singles prize as the top two seeded competitors Zhu Yuling and Chen Meng met in the final. 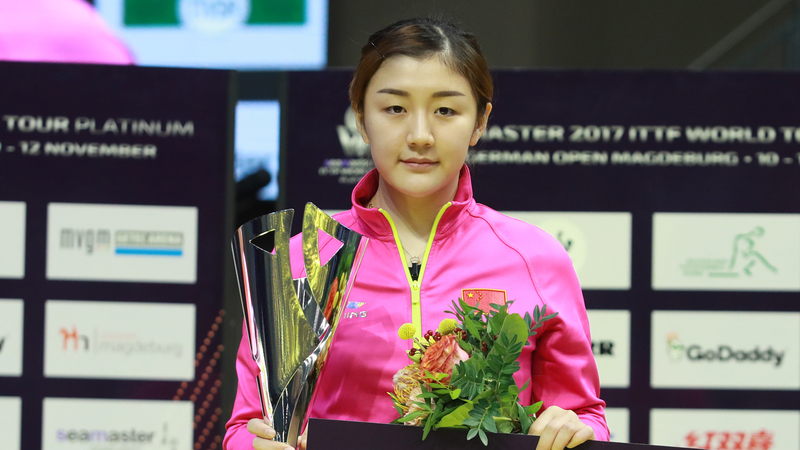 Zhu Yuling and Chen Meng earned their places in the final with respective victories over Kasumi Ishikawa and Feng Yalan in the last four and were both keen to leave Magdeburg on a positive note. In a match of two halves world no.1 Zhu Yuling was much the happier player during the course of the opening four games and deservedly found herself leading the tie by a commanding three games to one scoreline. However, Chen Meng miraculously found her way back into the match and went on to defeat her Chinese national teammate Zhu Yuling in the deciding game (9-11, 8-11, 13-11, 9-11, 13-11, 11-9, 11-4) to claim her third Women’s Singles gold medal at an ITTF World Tour Platinum event. The day concluded with the match all the home fans were hoping to see as Dimitrij Ovtcharov and Timo Boll competed in an all-German Men’s Singles final. Earlier in the day Dimitrij Ovtcharov stunned the top seed Fan Zhendong in the semi-finals with a sensational performance while Timo Boll booked his spot in the final with a comfortable outing against 14th Lee Sangsu to guarantee that the trophy would end up with a host nation representative. Very little could separate Dimitrij Ovtcharov and Timo Boll in an action-packed finale, but the tie was eventually won by the former of the two players who came away with a seven games win (9-11, 11-5, 11-9, 6-11, 11-7, 7-11, 11-6) to earn his fourth Men’s Singles title of the 2017 ITTF World Tour.